Gardendale() Lonely and depressed this Valentine season, Gardendale resident James Whitcomb has made a discovery he hopes will change his life and help to win back his ex-girlfriend. In a triumph of modern ingenuity, Whitcomb has created a powerful new use for his 1986 Dolby pro-logic cassette deck: that of making a mix tape. "I was sitting around last Saturday all depressed that Allison had dumped me for that traitor, Dana, so I started listening to some of her favorite LP's to try and cheer myself up," said Whitcomb. "Normally on Saturdays I listen to Car Talk on NPR, but I wasn't really in the mood, so I decided to record it and listen to the cassette on my way to church the next morning. So, I started recording NPR and pulled out my rifle to give it a good shine while I listened to the records. It didn't help though, I became more and more incapacitated thinking how much I miss her." As James was soon to discover, however, happy accidents often rule our unhappiest moments. At the time unbeknownst to the down and out Whitcomb, the input selector switch on his Hafler pre-amp was set to Phono1. "At first I was kind of pissed that Sunday morning," said Whitcomb, who had been counting on a moment of mirth with Click and Clack. "When I put the tape in, all I heard was a hodgepodge of scratches, pops, and music corresponding to my every interaction with the turntable. I got confused and angry." But slowly as Whitcomb listened, he realized that all of the songs he had played that lonely Saturday were now on the tape arranged in a pleasingly random order. "I couldn't believe it!" exclaimed Whitcomb. "I just knew that this was something big! 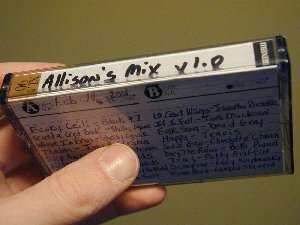 I thought if I made Allison a tape with the perfect mix of songs, she would think of me as she listened to it and want me back." Whitcomb's experiments began in earnest as he searched for the ideal love mix. After several attempts he finally settled on a tape he thought would work. He kicked the mix off on a riotous note with Funky Ceili by Black 47, but then immediately settled down into a more mellow mood. "I put on a couple of Shelby Lynne tunes and then some John P. Strohm. I remember she had me take her to the B&A Warehouse for a concert once, and I think it was those two that were playing. But it might have been Evan Dando and Juliana Hatfield." To cover his bases, Whitcomb included the latter two artists as well as Jonatha Brooke, Tara MacLean, and David Gray. He finished off the tape with Lynyrd Skynyrd's Free Bird just to let her know he was okay with the breakup. "But I just knew that the tape would bring her back," sighed the near-tearful Whitcomb. Since he and Allison are still friends it was no big deal for Whitcomb to send her the tape and a very nonchalant letter for Valentine's day. Sadly though, all of Whitcomb's effort appears to have been in vain. "The letter was kind of cute, in a pathetic sort of way," explained ex-girlfriend Allison in a phone interview with the 'Hamster on Tuesday. "James is a dear, dear man, but I don't know what to do with this tape. I mean my car only has a CD player and the tape deck in my home stereo has been broken for several years. It broke about the time I got a CD player, and I haven't missed it. Besides, with my boyfriend Dana's computer I can burn CDs faster and cheaper than making a mix tape, and they don't have all that hiss." In spite of his failure, Whitcomb plans to continue his efforts at getting her back. "I thought I would buy tickets to a really expensive concert and then ask her and Dana to go. I know she would only be going for the concert, and maybe because I invited Dana along, but maybe something would happen to bring us back together. Also, I could tell her I won the tickets on the radio to make it seem less pathetic, even though they don't usually give them out in threes." Despite the repeated dead ends in his re-bid for the love of his ex, Whitcomb promises that he will continue to play around with the cassette tape format and pursue his crusade to find that ultimate mix. North Birmingham() Crowded into a small pocket between train tracks and sidestepping emergency vehicles, a crew from the City of Birmingham Works Department completed the task of paving one North Birmingham street in a short two weeks. 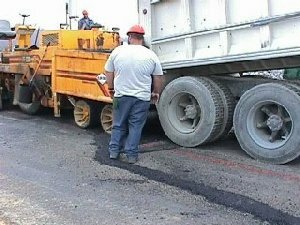 The paving has met with support from the few drivers in the area, while provoking outrage from city leaders. Leroy Bandy, councilor for District 9, called the Works Department personally to ask why they were wasting city money paving that street. "I was outraged," says Bandy. "There are so many more important things to spend money on in this city." Bandy then outlined some vague projects that he has planned for the district and seemed most proud of a study tour he took of successful urban communities throughout the nation. Bandy hopes to bring some of the better ideas to Birmingham where they are sure to work just as well. It seems that the Works Department was not authorized to pave the North Birmingham street and will have to tear up the asphalt next week. The only thing they were supposed to do was fill in the larger potholes which might have caused accidents. "It is a disgrace to see city funds going to waste like this," said Bandy. "If I had the authority to decide where all the money goes in my district, then none of this would have happened." Another man surprised by the paving is North Birmingham Neighborhood Association President Jimmie Coleman. "I couldn't believe they paved that street. We usually only get about one street every five years, and this makes two in the past year." Employees at Birmingham Steel, an area mill, were initially upbeat about the paving. "At least we have a few feet of smooth road," said Frank Crow a first shift millwright at the plant. "The roads around here just tear up my truck. But it ain't my neighborhood. If they don't want their streets paved, I guess they have that right. As for me, I get out of here before dark if I can help it." One explanation for this unusual paving may be that the Works Department, lacking guidance from the city, had instituted a plan to pave streets in order based on their condition. With worst being first, North Birmingham was a logical place to start. Bandy and the other city councilors have put an end to this plan and have begun an investigation into how Works Department funds should be allocated. "This indiscriminate spending has to stop," said Bandy. "Our first priorities are The Summit and The Turf Club." Long time councilor and curmudgeon Aldrich Gunn agrees with his colleague. "I don't want them spending that money with out my permission. When it comes to the end and we don't have money to pay for the lawyers what are we gonna do then? We've got families starving in this city and we're out paving streets? You can't put the dope on the camel before you teach it to spit." The Plain() In an effort to energize the fan base before the start of this year's football season, Auburn University is set to add yet another nickname to their storied franchise. The nickname will not replace any of the three current ones, but will be used in conjunction with all of them. The Auburn football team, which call themselves the Tigers, have a battle cry of War Eagle, and are commonly referred to as The Plainsmen, believe that a new nickname will not only enhance their descriptive position over their SEC foes, but also help attract new fans. "From now on when our fans refer to their team they can call us the, Stone Cold Auburn Tigers of the Plains, while the War Eagle will still be used specifically for kickoffs," said Auburn AD David Housel. Housel explained that the already popular nickname was chosen to attract existing XFL fans to a whole new brand of football. The announcement comes after week long negotiations with Vince McMahon, CEO of the World Wrestling Federation, whose own top superstar Steve Austin shares the name Stone Cold. With the XFL now in Birmingham, McMahon was very receptive to the idea. "I said sure they could use the Stone Cold name as long as we get a few advertising kickbacks. We are talking about having the Auburn players wear the name of an XFL team on their jerseys. And the Auburn cheerleaders will go into the stands during games to hand out XFL merchandise." When asked about the change coach Tommy Tuberville was more than enthusiastic. "I think that the establishment of a primary nickname for our fans is a really exciting development. It is difficult for fans to dress like tigers and eagles, but almost all of them have outifts that make them look Stone Cold" Housel went on to add, "Its all about options. Our fans want choices, and that's what we are giving them. They can call us the Tigers, The Plainsmen, or the Stone Cold Auburn War Eagle Tiger Plainsmen. We have given them choices, and we think they will respond with overwhelming support."